The extremely powerful and long-life 1,010 W motor of the MENZER LHS 225 PRO is positioned exactly where it is needed – at the cup wheel. The direct drive system has two distinct advantages: On the one hand, all motor power is transferred directly onto the driving disc without any loss. The abrasion rate is therefore higher and sanding more efficient. And on the other hand, there is no need for a high-maintenance drive shaft. In effect, maintenance costs are significantly reduced, while the MENZER LHS 225 PRO enjoys a much longer service life. Three key components ensure the constant availability of the MENZER LHS 225 PRO and significantly reduce maintenance costs. One: The direct drive, which does not require a drive shaft, making it very low maintenance. Two: The smart electronics, which ensure a soft start of the motor and therefore protect the individual components. Three: The high power reserves of the motor, which protect it against overload even in very intense work sessions. Our MENZER LHS 225 PRO gives you complete freedom of movement. The extremely agile cup wheel adapts to the wall or ceiling in any position. Even hard to reach areas are sanded comfortably and efficiently with this cup wheel. Our MENZER LHS 225 PRO can easily work edges and difficult transition areas because of its removable nose section. You will achieve even faster work progress when sanding walls and ceilings. The MENZER LHS 225 PRO comes with a 6-hole driving disc for efficient dust extraction in combination with a MENZER industrial vacuum cleaner. The versatile brush ring increases vacuuming efficiency, as it adapts seamlessly to the substrate, ensuring a good dust seal. 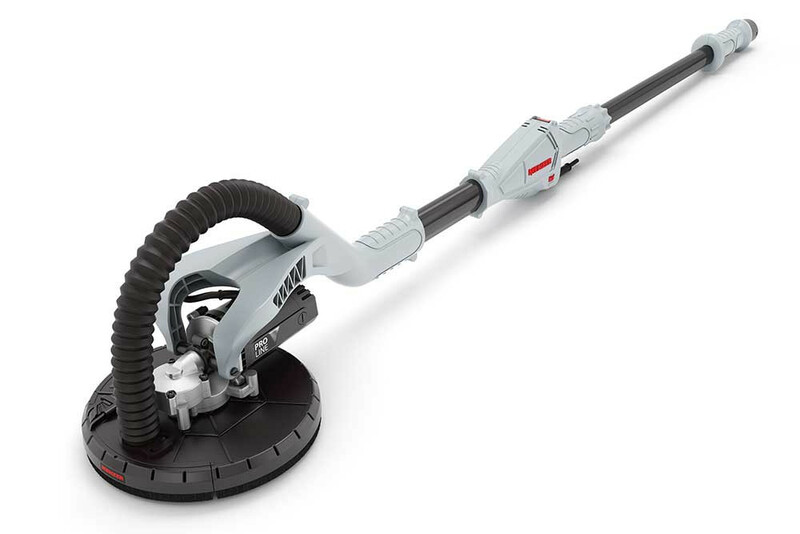 Vacuum cleaners from third party manufacturers can easily be connected via the MENZER universal adapter.